On February 18, 2014, Lynn was a standing passenger on an MTA bus heading to work. The bus Lynn was on stopped at a bus stop near the intersection of Guy R Brewer Boulevard and Claude Avenue to allow passengers off. As passengers were getting off, another MTA bus rear-ended the bus Lynn was in. Lynn fell backwards to the ground and hit the left side of her body. The operator of the other bus claimed that as he was stopping, the bus slid on the wet slushy-like snow that was on the pavement; causing the collision. Lynn was taken by ambulance to NewYork-Presbyterian Queens where she had diagnostic testing performed and was given pain medication before being discharged. As a result of the accident, Lynn suffered injuries to her head, left shoulder/neck, left hip/back and left knee. She underwent therapy for several months until she reached “maximum medical improvement” (although she was still in pain) and continued her own therapy through a home exercise program. When conservative treatment failed to improve her condition, Lynn underwent pain management injections. She was also unable to go back to work for over 3 months. A close friend of Lynn referred her to Adam Handler – The Case Handler! 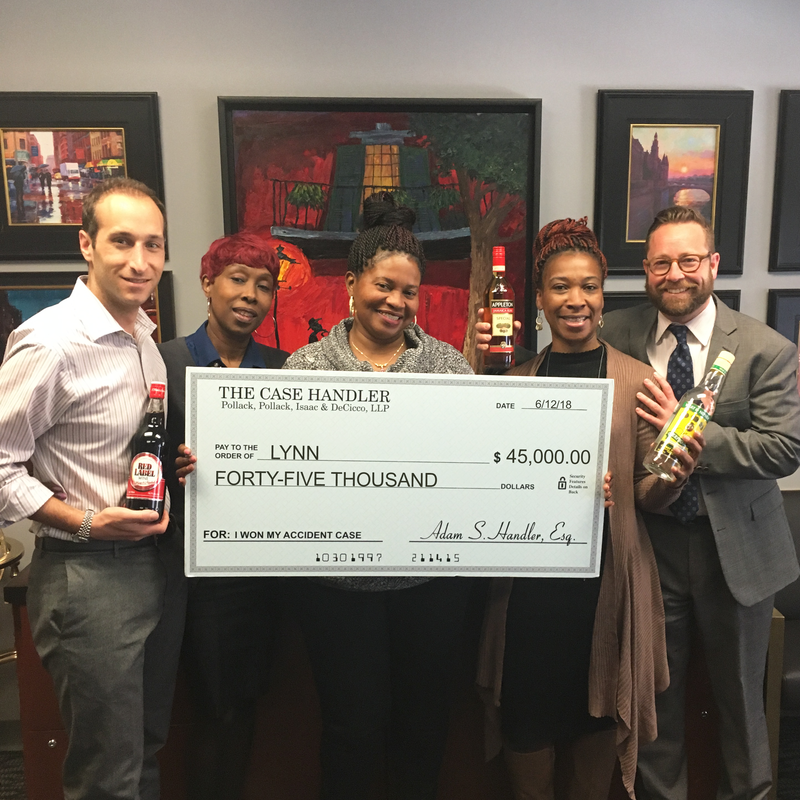 Although Lynn had missed months of work due to the accident, our team recovered all her lost wages, we took care of all her medical bills, and we effectively won $45,000.00 from MTA Bus Company! It’s not every day that you hear about a bus crashing into another bus, but it does happen (as Lynn experienced unfortunately). Bus accident lawsuits can be very complicated. Not only does your lawyer need to be well-versed in local and state traffic laws, but they also need to understand specific regulations that govern bus operations since MTA buses (and other types of buses) have their own set of rules and regulations. If you were seriously injured in a New York bus accident, speak with an experienced Queens bus passenger injury lawyer that will be a “fighter” for you.